I should start out by saying The Bone Church deals with a part of history I know very little about. Weaving back and forth between 1944 and 1956 it takes place mainly in Czechoslovakia and sets as its backdrop the Nazi occupation (in the 1944 timeline) and later the heavy Soviet control of the country (in the 1956 timeline). Knowing so little about this time and place in history, much of the heavier political and social elements, while interesting, were somewhat confusing for me. Once I went and read a little more about these shifting factions I was able to better understand the underlying themes and how they affected the characters. However, even with the extra reading I found myself sort of glazing over the politics and focusing my attention and enjoyment on the characters and their actions. I found all of the characters incredibly interesting. The seemingly visceral connection between Magdalena and Felix was simply fascinating and I kept flipping the pages to see if they would be able to escape occupied Czechoslovakia and, in the later timeline, find each other again. My biggest problem with the Magdalena/Felix portion of the story was I felt like both timelines just sort of plopped the reader down in the middle of action without giving a lot of backstory to give the reader a better understanding of what happened to lead up to what was currently going on. How did Magdalena and Felix come to know each other? How did their relationship develop into the close and unbreakable bond it became? How did Magdalena and her mother come to be living in the Andel's basement? What had happened between the two storylines that lead to where both characters found themselves in 1956? While tiny hints were dropped throughout the story to give the reader a taste of the answers to these questions I enjoyed the characters so much I just wanted more information. The secondary characters were just as mesmerizing and what I loved the most was the way each of these characters kept surprising me! Just when I thought I had a good idea of the motives and allegiances of a character they would do something to flip that right on its head. Those that I thought would sacrifice Magdalena and Felix for the simplest thing ended up being their greatest champions and those I thought really had their back ended up doing things for their own selfish wishes that put the lovers' lives in danger (sorry for being vague...I don't want to give any surprises away!). I love when I think I know the essence of a character and find out I had no idea who they really were. Another exciting element of The Bone Church that I was surprised I enjoyed as much as I did was Felix's paranormal abilities. Felix can not only communicate with the dead but can interact with them as well as the divine to get himself out of some sticky and dangerous situations. It isn't heavy handed (which, for me, would have made the whole story feel silly and unrealistic) but is utilized at just the right time and in such a delicate and beautiful manner that it really added a wonderful touch of mysticism to the whole story and helped pull in the religious elements of the storyline as well. There is so much more I could discuss about the book - the actions of the Prague Underground, the plot to find the authentic Infant of Prague, the Bone Church itself - but that would make for a very long review. 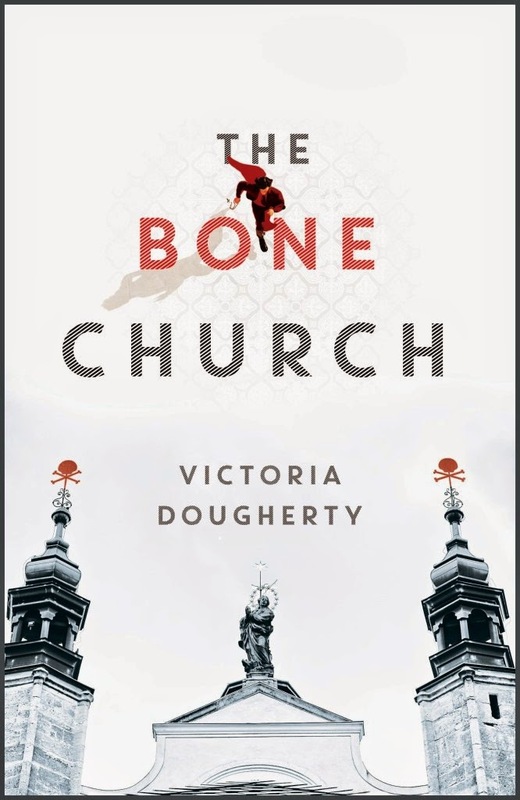 Suffice it to say The Bone Church has something for just about any reader to enjoy. Those that are well versed in the political, social and religious goings on in Czechoslovakia during these time periods will love it that much more. I think if I knew more about these elements and if there was more backstory given for Magdalena and Felix's love story this would have been a strong contender for my favorite book of the year. I think it fits the story perfectly! It is stark and concise and shows that religious element that underlines much of the action. The little skull and crossbones at the top of the church also represents the Bone Church itself. Anything more vibrant or decorative would have misrepresented this bleak and tense story for me. Thank you to Amy at Historical Fiction Virtual Book Tours for providing me with my review copy of The Bone Church in exchange for an honest review and for allowing me to be a part of this awesome blog tour! Be sure to continue reading below for author information, where to buy the book for yourself and the tour schedule so you can follow along and see what other bloggers are saying about The Bone Church! Wow, thank YOU, Victoria, for commenting on my review! I'm blushing to have an author read my review :). Yes, I look forwarding to reading more of your books and I am far from sick of you...I absolutely loved having you here!!! This sounds like a fascinating read of an under-represented historical setting. I'm especially intrigued by the talking to dead people aspect.